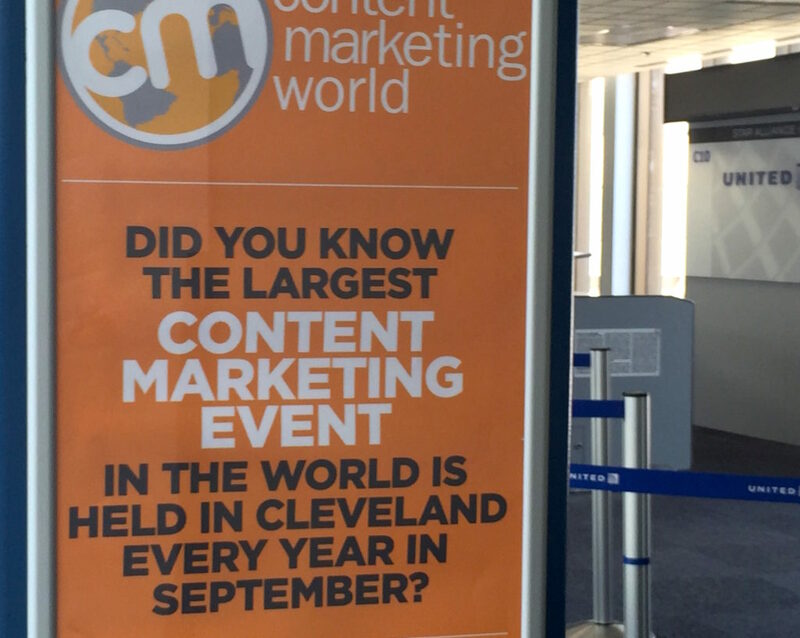 Home Posts tagged "Doug Kessler"
I spent last week at Content Marketing World in Cleveland and it was a great experience. Content Marketing World has become a huge conference and it was very well done. More than 3,500 content marketing specialists attended from 60 countries, as did more than 550 companies, including 40 of the Fortune 100 companies. Two hundred and twenty five content marketing experts spoke. On the first morning, as we streamed into a large exhibit hall for opening keynote speeches, there was a slight backdrop of drumming in the air which heightened anticipation. Fog rolled and Star Wars music played (the closing keynote speaker was Mark Hamill, a.k.a. Luke Skywalker). The stage was a space ship’s control panel with windows looking out onto the galaxy. Dramatic. I got the sense big things would happen. Joe Pulizzi, the orange-clad founder of Content Marketing Institute, which puts on the annual conference, spoke first. (The conference color is orange and it’s everywhere.) He talked about a previous content marketing company he founded that failed, he ultimately realized, due to a lack of commitment. The problem: they were not dedicated to being leading experts in content marketing. Out of that experience came Content Marketing Institute, he said, as well as a dedication to content marketing. He said that right now just two out of ten global marketers, only 20 percent!, say they are fully committed to their content marketing approach. The other 80 percent is creating a lot of marketing collateral, going through the motions, but not building a loyal audience and not telling a different story. “Meh,” he said. He told us he was going to title his presentation, “Meh” and the crowd laughed. But he said that’s where so many people are right now. “We’re doing what looks like content marketing, but are only somewhat committed. Can you be ‘somewhat’ committed to your relationship, to driving, to being a great father?” A slide of Darth Vadar popped up in his slideshow. “Mediocre content will hurt your brand more than doing nothing at all,” he said. He pointed to LEGO as a fully committed brand. He mentioned that he used to get the LEGO magazine Brick Kicks 30 years ago, and today his kids still sprawl across the floor with their LEGO blocks. As a content writer helping agencies and brands needing interesting, well-crafted and well-directed content for their clients, as well as developing content marketing for my own brand, these were great reminders. It was a terrific conference. I learned a lot, met interesting people and am totally re-energized about my work. Doug Kessler wrote a terrific (and fun to read! he’s a great writer) write-up of the conference from midpoint, as he sat wide-awake with jetlag in the middle of the night. I had a little experience with that, too.